SES San Francisco was a fantastic event for the team at TopRank Online Marketing. We had four team members in attendance and were involved in everything from speaking on topics such as content marketing and SEO, moderating sessions, to live blogging presentations and interviewing speakers. It was great to see some new faces, and run into some familiar friends. TopRank covered everything from the opening keynote by Avinash Kaushik to the surprise visit from Matt Cutts of Google. Below we’ve included an overview of our involvement at #SESSF as well as some additional highlights from the conference. TopRank CEO Lee Odden (@LeeOdden) gave a solo presentation titled “Optimize B2B Content Across the Sales Cycle” to open day 2 of SES San Francisco. Lee immediately began engaging the audience by taking a poll to see exactly how much they were integrating SEO, social media, and content marketing. 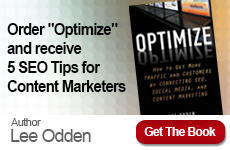 Much of the presentation was based on his new book Optimize and how marketers must create content for the different stages of the customer journey in order to better attract, engage, and inspire their customers to take action. This is a methodology that TopRank Online Marketing practices when implementing for B2B clients ranging from large organizations like McKesson to fast growing companies like Tibbr. Senior Technical SEO Manager Thom Craver took a more SEO focused approach with his session “Web Analytics Deep Dive” on the opening day of SES San Francisco. A key focus of Thom’s presentation was making information work for your business. As an agency, TopRank must take a very analytical approach to helping our clients solve their business problems. Account Manager Alexis Hall (@alexis5484) and Marketing Manager Ashley Zeckman (@azeckman) spent their time at SES San Francisco creating live coverage of the event by live blogging speaker sessions. Below you will find a list of live blogs and articles written by the TopRank team. *Over the next few days the TopRank team will continue to share articles based on sessions attended at SES San Francisco. 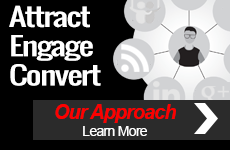 Be sure to check out TopRank Online Marketing Blog for these additional posts! SES San Francisco was flush with a wealth of information from some of the industry’s leading search experts. The conference presented the perfect opportunity for TopRank team members to learn more about the Internet marketing industry and share the latest in SEO, content marketing, and social media trends with our readers.